Made with the softest Greenfirst treated cotton cover. Allergy free microfiber filling will add a further layer of luxury to your mattress, to deliver even more comfort while you sleep. Stretch skirting provides four-way stretch for a snug glove like fit. Greenfirst is a natural anti dust mite treatment. Natural treatment based on lemon, lavender and eucalyptus essential oil extracts. Its effectiveness and hypoallergenic properties are verified by independent laboratories. Eliminates / Kills dust mites within 24 hours Twin: 38 x 75 x 16 in Full: 53 x 75 x 16 in Queen: 60 x 80 x 16 in King: 78 x 80 x 16 in Cali King: 72 x 84 x 16 in Care Instructions: Spot clean if necessary. Can be machine washed on gentle cycle. Can be warm tumble dried (NOT HOT). Best to line dry. Do not bleach, can be dry cleaned. Please ensure your washing machine and/or dryer is large enough to cope with the cubic volume of this product before washing. Electric blanket is best positioned under topper. Greenfirst® Mattress Toppers are TREATED with Greenfirst® natural treatment that kills/eliminates dust mites in 24 hours! If you have a dust mite allergy, you may feel cold like symptoms year round. Dust mites are also known to make asthma and eczema symptoms worse. DON'T JUST CREATE A BARRIER to REPEL THEM. (then they'll just go somewhere else). STOP/KILL THEM! 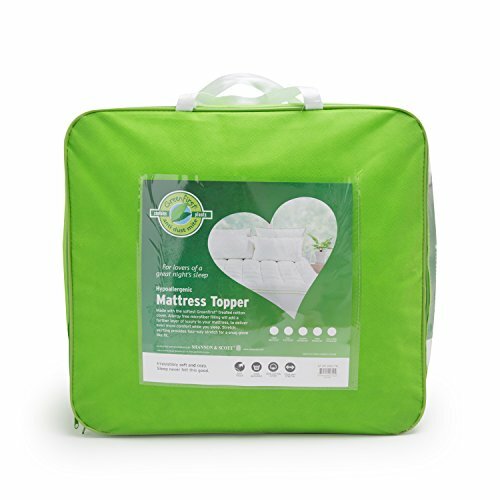 Greenfirst® Mattress Toppers are PADDED high and covered in a cool breathable cotton cover that creates a luxurious softness while providing extra comfort. Greenfirst® Mattress Toppers are FITTED to standard bedding sizes so that the padding stays in place. The skirt is fitted with an elastic strip that hugs the mattress and spreads the topper throughout the mattress. Greenfirst® treatment is TESTED by independent laboratories to verify the effectiveness of it's hypoallergenic properties. If you have any questions about this product by Greenfirst®, contact us by completing and submitting the form below. If you are looking for a specif part number, please include it with your message.